These guys are awesome!! Ryan P and team were amazing in helping us build our pool. They answered everyone of our questions about the process and we had a pool in exactly 33 days. I was very nervous about doing something like this ( Building my own pool) but these guys walked us thru the process answered all of our questions..... the biggest incentive to using these guys was the savings.... we saved A TON of money by using them VS a pool company. Approx 40 to 45% less in costs. ( no joke). I have already referred them to 2 different friends who also built their pool! We've had a great experience with BYOP. 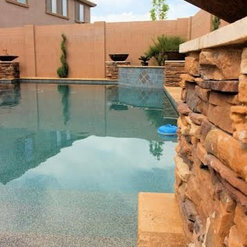 We were hesitant initially because we didn't know the 1st thing about building a pool but Ryan was extremely helpful throughout the entire process. We were able to save thousands on our pool. We are so glad we chose BYOP! Thank you!! BYOP was the best way togo to build our pool. They delivered exactly as promised. 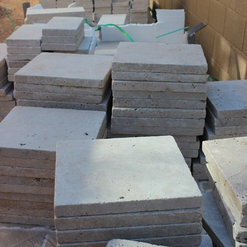 We used them to help design/build our pool and backyard. They were quick responsive and knowledgable. I asked many many questions and they always answered quickly and gave great advice. 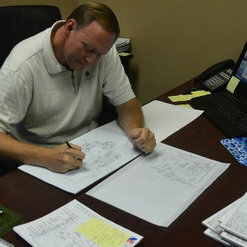 Our project was completed in much less time than and expected and we saved thousands of dollars. If you want to get more for your dollar and have more control over your project they are a great way to go. As a plus Ryan and John were the reps we dealt with and I can't recommend them more. We are return customers to BYOP, after having built our first pool with Todd's help back in 2013. When we purchased our new home - sans pool - there wasn't a question on who we would call to get us through the new pool process again. Todd and his crew at BYOP were knowledgeable about local requirements and ordinances, available throughout the construction project and quickly answered our (often pestering) questions, and essentially held our hands through the entire process. 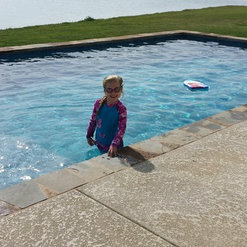 We saved a ton of money by building our own pool, and got the pool we wanted without breaking the bank. We are embarking on our second pool with BYOP, and I have every confidence the process will go as smoothly as the first did. 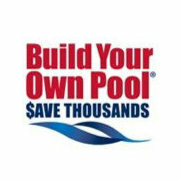 I highly recommend BYOP to everyone - it's not as hard as you might think to Build Your Own Pool ! This place is awesome!. I can say that my experience so far has been nothing but positive. This company works in conjunction with WPE and is a huge convenience. BYOP designs your pool based on your needs and Wholesale Pool Equipment fulfills your pool equipment needs based on your pool plans. I am loving this! 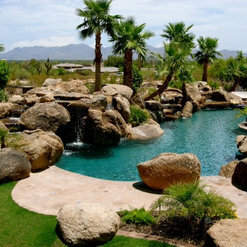 Taking on a pool project without a huge pool company is stressful enough. Taking on this project by myself is even more stressful, however, everything is laid out for me to complete my project while staying in control. I will definitely use this company again. BYOP helped me design and build an amazing modern pool. I was able to get extra features and upgraded finishes with the money I saved building my own pool. The BYOP team is very experienced and patient and really helped my design come to life. Would definitely recommend them to anyone considering a new pool. Had a great experience with BYOP. Todd was very helpful and always quick to respond. The process certainly requires more attention by the owner to manage, but it allows for better controls! After receiving several quotes for my pool I contacted BYOP. In the end, I was able to shorten the construction schedule by 2-3 weeks and get a lot more done for the same budget. Don't let the process scare you - It's not that hard. Just ask a lot of questions and you'll be fine! 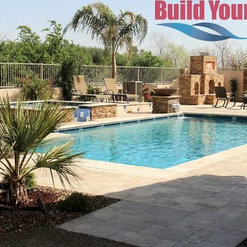 We give Build Your Own Pool and their unique approach the highest recommendation. We bought a home last year with a large damaged plaster pool. We worked with the consultants at Build Your Own Pool and they guided us with ideas and resources. We had the plaster removed, re-coated the pool in Pebble Tec, (I love the color) added new plumbing, new tile, new pump, new heater, new lights and a totally new Jacuzzi -- designed by BYOP -- that integrated with the existing pool. At every stage, and with every component and with every trade involved we got exactly what we wanted and we saved money. In this experience we saved on average 35-40% on every stage of the project. The Build Your Own Pool team gave us exactly what we wanted -- we saved thousands of dollars. The savings enabled us to add more fine touches and upgrades. The key to this group’s success is the integrity of the consulting team and their relationships with the tradespeople in their network. Each craft group has deep experience. They delivered: design, excavation, re-bar, plumbing, concrete, tile, and electrical. Although I have no experience in any of these areas – the BYOP rep explained the process, showed me the step-by-step plan, developed a budget and they made clear exactly how it was going to happen. Their plan and approach made sense and would save us money -- so we went for it. The entire process went as planned, was easy and the final outcome is fantastic. 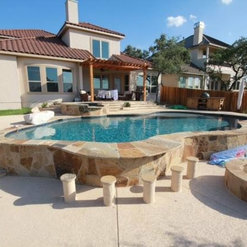 The pool and Jacuzzi are beautiful. We love the color, the lighting, the waterfall - it's gorgeous! 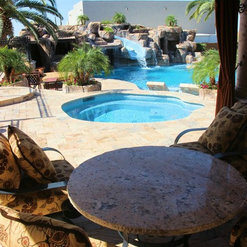 The pool and Jacuzzi are a source of beauty and joy for our family and friends. 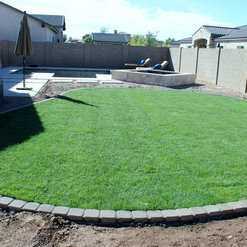 I love the final result and I look forward to expanding on this backyard with BYOP in the near future! Do some research and compare! These folks deliver quality and value.